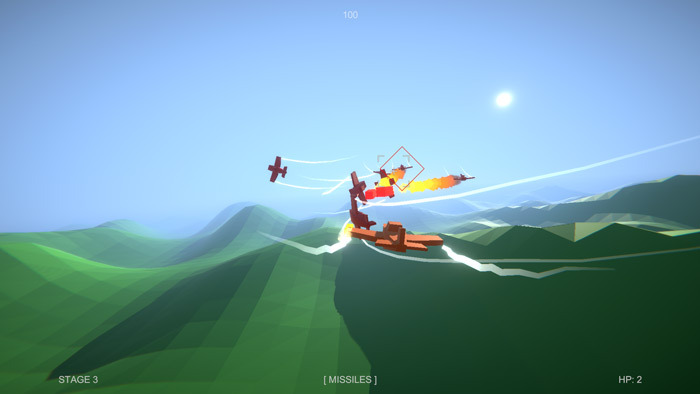 "Shoot down enemies over a procedurally generated landscape"
Rough Riders is a fast paced flying game where you pilot a plane over a procedurally generated landscape trying to shoot down and avoid attacks from enemy planes. 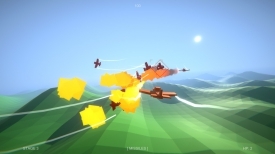 Using only your mouse as a control you will use this to maneuver the aircraft along with using the right mouse button to fire your gun and if you hold down the left mouse button and aim it on an enemy plane for 3 seconds you can then release a missile and you can even lock on to multiple enemies. There are twelve stages each increasing in difficulty for the player to try and make it to the end of, the graphics are kind of blocky but charming and as the influence here was classic arcade rail shooters the style fits very well. A fun and fast paced game, the only issue is getting to grips with firing missiles and also trying to use the regular canon as these can both be incredibly hard to aim which is okay for the first few stages but not when there are plenty of enemy missiles coming your way too! Blast your way through hordes of enemy fighter planes and try to make it to the end of all 12 increasingly difficult waves. You can download Rough Riders here for free.